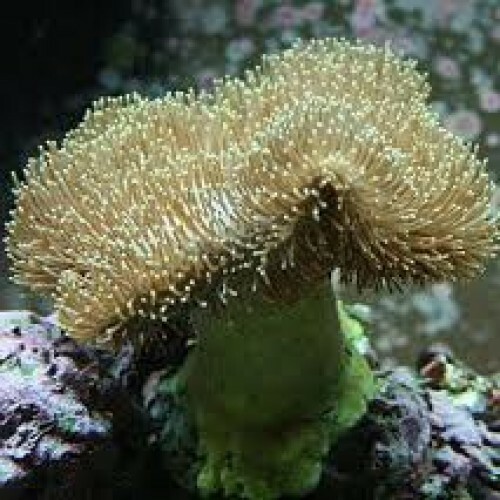 The Toadstool Mushroom Leather Corals are relatively peaceful, but adequate space should be provided between them and other corals in the reef aquarium. Some can produce toxins which are harmful to other reef inhabitants. The more plain Sarcophyton Leather Corals from Idonesia are easy to maintain in the reef aquarium and make an excellent coral for the beginning through expert reef aquarist. The colored Sarcophyton Leather Corals from Tonga are much more difficult to ship and maintain, and are only for expert aquarists. Toadstool Mushroom Leather Corals require medium to high lighting combined with medium to strong water movement. For continued good health, they will also require the addition of iodine, strontium, and other trace elements to the water.